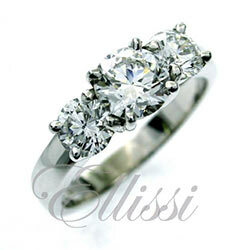 The Round Brilliant cut diamond is the most popular of all the diamond shapes that are available. This is because it is the most versatile cut. Not having corners makes the round shape suitable for many different ring designs. Other shapes with corners have less flexibility. This is because the position of the claws in the ring is dictated by the corners of the diamond. The ring design would look very odd if the claws were not placed in the corners. Another very important reason for the popularity of the round brilliant cut diamond is from a technical perspective. It is the best shape that cutters have been able to come up with so far that maximises the brilliance of the diamond crystal. The “Excellent” Round brilliant Cut. “Excellent cut” is a term is used by the jewellery trade and the Gemological Institute of America (GIA) in its certification. The term is used used to describe a diamond’s cut when it matches the GIA’s standard of correct proportions. A diamond that has been graded as having excellent cut will have the best refractive qualities. It will have no dead areas and no overly refractive regions either, as you may see in other diamond shapes. “Excellent cut” means that the cut achieves very close to the maximum physical diameter possible, without compromising the cut of the diamond. This does not mean just cutting to achieve the maximum diameter, as this would result in a poorly cut, shallow diamond that is too big for it’s weight. Mathematically perfect diamonds with the absolute maximum physical diameter that could be achieved are seldom, if ever, cut. This is because in order to reach that mathematical perfection, diamond cutters would need to cut the diamond’s outer edge (the “girdle”), too fine. So fine in fact, it would be susceptible to damage. Cutters will normally give a well cut diamond a girdle that is around + or – 3 % thickness. In other words, the girdle is equivalent to 3 % of the diamond’s total depth. Not all “Excellent” cut diamonds will be exactly the same in every respect. Of course being at the highest level of cut grade, all are very good indeed in this one regard. This is not to say that every one will be top of its game in the other grading areas, as every diamond is different. “Excellent” cut is a cut grade that only applies to round brilliant cut diamonds. This is because the round brilliant cut diamond can be cut in such a way that it’s proportions conform to a mathematical standard. Other cut shapes all vary in their dimensions, so they cannot be graded as “Excellent”, as there is no one standard to measure them by. For these cut shapes, it is impossible to come up with a “one size fits all” formula. The GIA did not invent the idea of excellent cut. That distinction has been attributed to Marcel Tolkowsky, a mathematician and diamond cutter who developed the formula some 100 years ago. The GIA has refined to some extent the excellent cut parameters Marcel Tolkowsky first set out. Remarkably, considering all the technology now at our disposal, the standard is not too much different to that worked out by Mr. Tolkowsky all those years ago. The round brilliant cut is among one of the most exacting of all cut designs when cut to the highest levels. The very best of these cuts also display what we call a “Hearts and Arrows” ( H & A ) pattern. The pattern can be seen when viewed with a hearts and arrows scope. The GIA does not make mention of this in their reports, however it is easily demonstrated when viewing a diamond. When you look at a hearts and arrows diamond without the aid of a scope, you can see an 8 pointed star pattern in the form of arrows. This is seen if you look closely face to face with the top of the diamond. 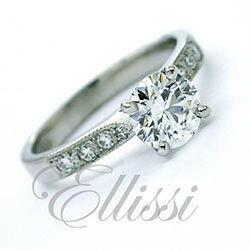 If you look at the diamonds in the round brilliant cut diamond rings section on the ellissi site, you can see that many of them display the arrows effect. The heart effect is viewed from the back of the diamond, through a hearts and arrows scope. The scope reveals the alignment of reflected facets in 8 geometric “hearts”. This is an illusion created from reflections within the diamond. Hearts and arrows is something that can only be seen if the diamond is of the highest cut standards. It should be noted that many round brilliant cut diamonds will show the heart effect, but not the arrows. Such diamonds are not classified as H & A diamonds. Diamonds that have a EX EX EX grade are called “Triple Ex”. This means that the diamond has not only been graded as “Excellent” Cut, but also has been graded as being “Excellent” in Polish and Symmetry too. This is the highest classification possible for these areas in the GIA grading system. When a client is looking for the best possible Round Brilliant Cut diamonds, Ellissi looks for more than just the EX EX EX level. Clients who want the very highest standard of diamond should consider “QuintEX”. This is a diamond that is excellent in five key areas: cut, polish, symmetry, hearts and arrows and most critically, lustre. We look beyond what the GIA certificate can tell us, to make sure that we are only considering the very best diamonds. A QuintEx diamond is the highest in all areas of diamond finish as well as diamond crystal appearance. Combining this with the best clarity grades, gives the highest possible outcome in diamond performance.